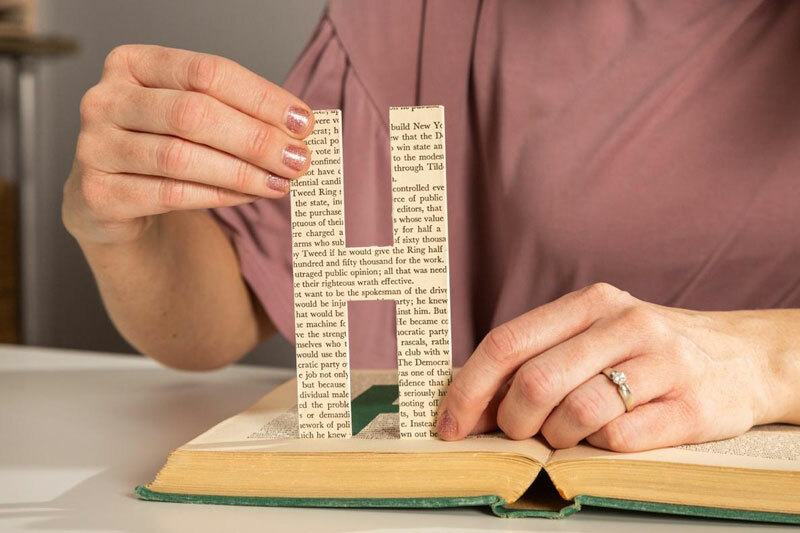 We were inspired to create a “pop-up book” effect with letters that spell out the baby’s name for a unique baby shower centerpiece. Chipboard is such a versatile material that cuts out beautifully with Cricut Maker®. The pop of color we added under each letter really allows them to stand out and makes this truly a statement piece! 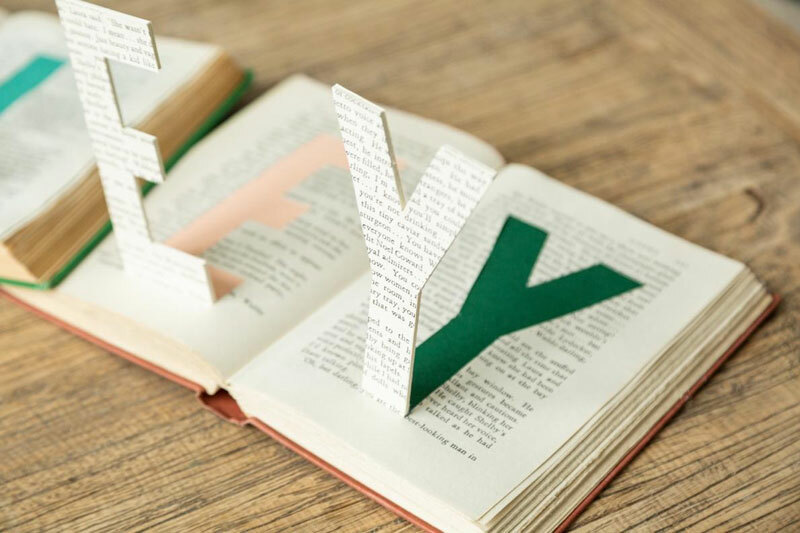 To customize the Book Letters project to your desired name, open this project file, Book Letters and select “Customize.” Then use the text tool to select the text you want to change, and type in your desired name. Use the 'ungroup to letters' option before cutting on this project. If you’ve never cut chipboard, you’ll be amazed at how precisely it cuts on the Maker! The weight makes it ideal for 3-D projects or anything that needs a little more stability. Start by taping the chipboard to a StrongGrip mat with masking tape on all 4 sides. You can also tape across each corner but make sure your design will not overlap any places that are taped down. Tip: Your chipboard piece must be 11X11 inches for the Knife blade to work its magic. The closer your images are to the center, the better they seem to cut. I was very generous in giving a large border around the letters and the edge of the chipboard. This also allows plenty of room for the tape. Follow the directions in Design Space for cutting chipboard. Don’t forget to switch to the Knife Blade and move the 4 white star wheels all the way to the right. Chipboard takes several passes to cut - but your patience will pay off! At the end of the last pass, double check to make sure your letters have cut all the way through and perform another cut pass (if necessary) before unloading the mat. 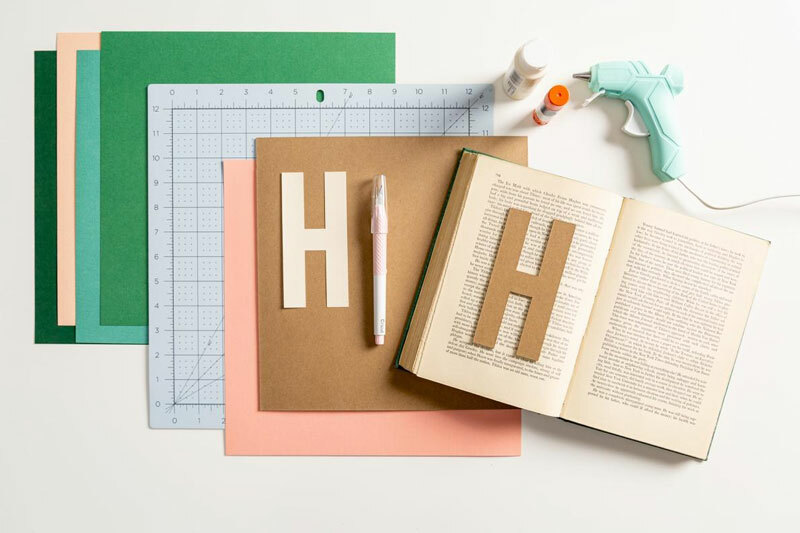 Cut a duplicate set of letters in cream cardstock with the Fine Point blade and LightGrip mat to match each letter. These will go on the back side of the letters, so make sure to mirror before cutting. To hide the dark edges and back sides of each letter, I painted all edges with cream craft paint and a foam brush. 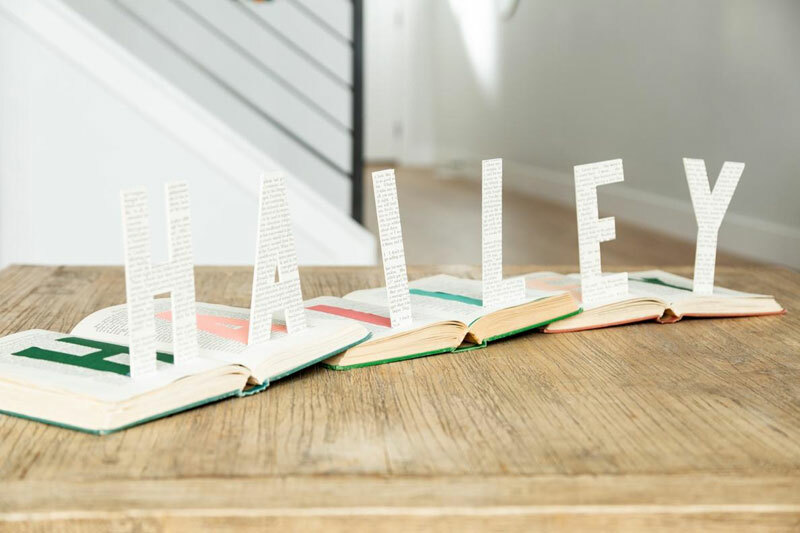 You could also paint the back of each letter, but I found it was easier and had a much cleaner look to cut a mirror-image of each letter in a matching cream cardstock an use glue to attach. Open one of the hardback books towards the center and choose two book pages for the letters, making sure you have pages with mostly text and not a lot of spaces. 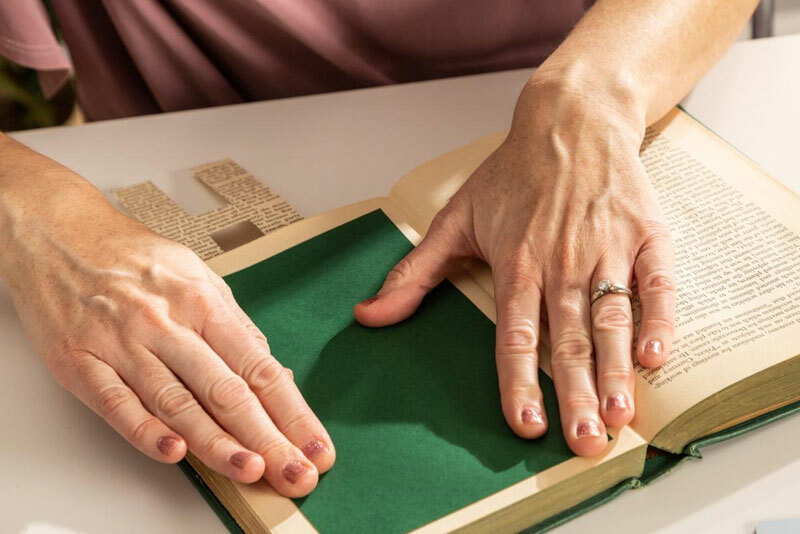 Place the self-healing mat under one book page and line up a chipboard letter along the bottom line of text on the page. Use the TrueControl knife to cut around the chipboard letter EXCEPT for the bottom edge. 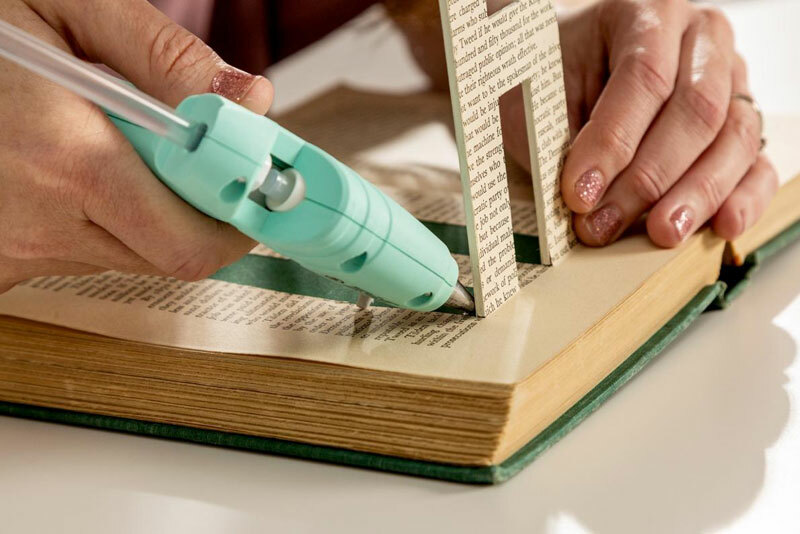 This knife is such a great tool for any paper crafters! 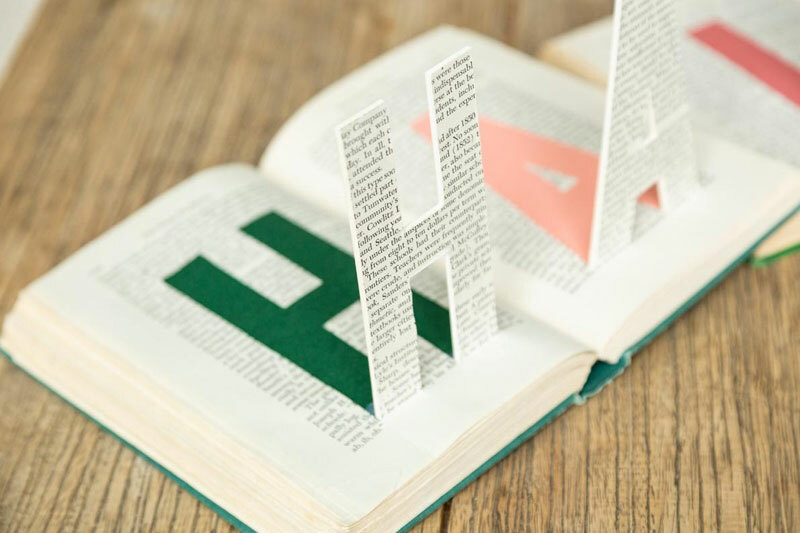 If any letters have cutouts (A, for example) save the piece of the book page to glue on the corresponding area of the colored cardstock. Lift the letter free and fold it down. 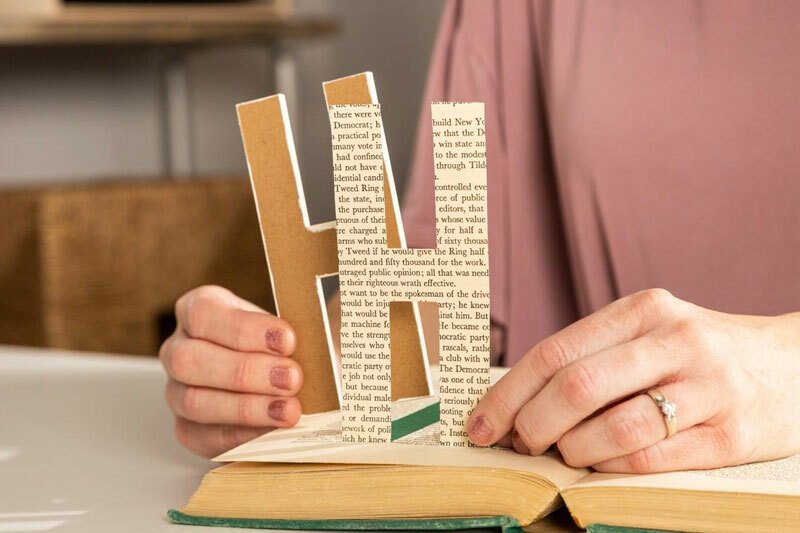 You will also need one piece of colored cardstock in whatever color you choose for the back of each book page - this is where the letter will show through! 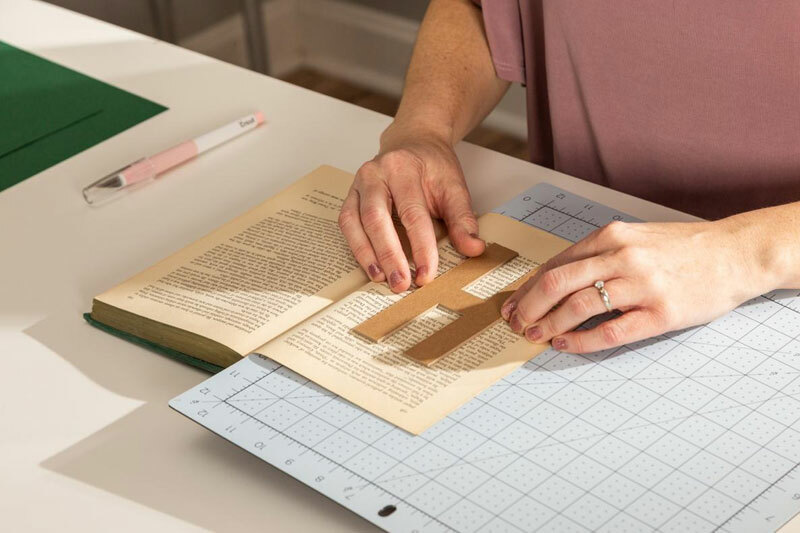 Measure the size of your book pages and cut the cardstock just smaller than each page. 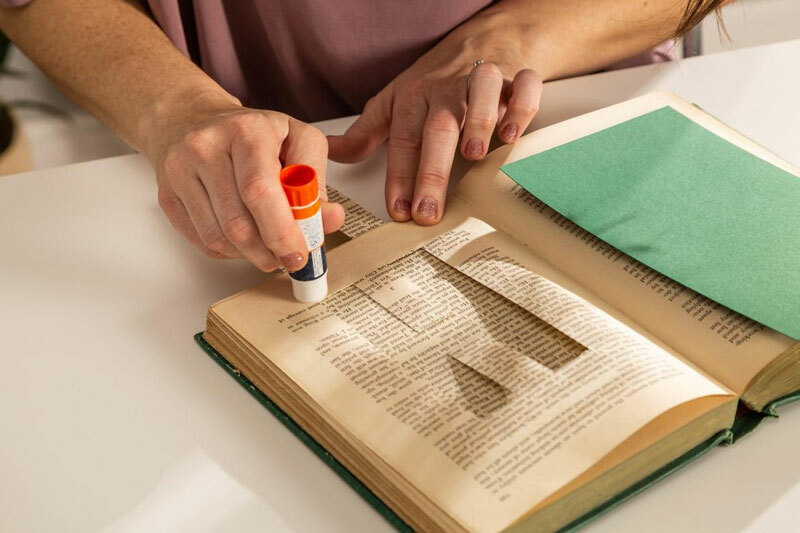 Turn to the back of the cut page and apply adhesive to the back of the page. We like to use a Craftbond-strength glue stick. 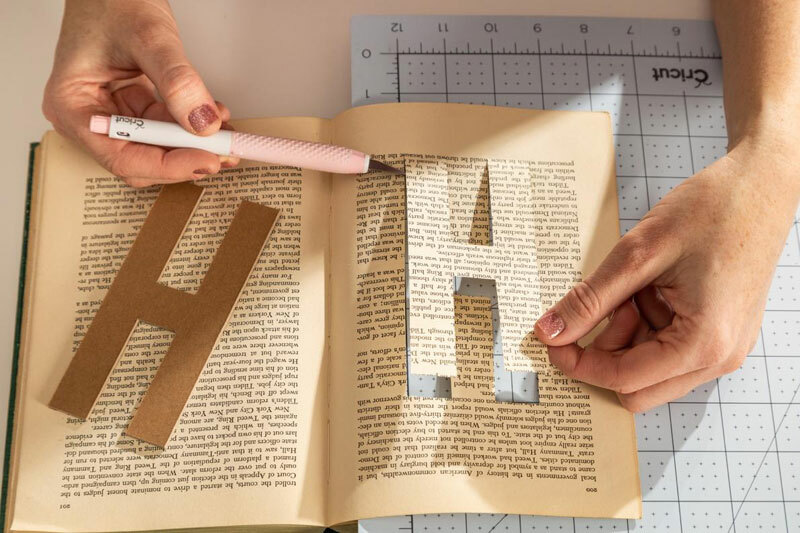 Attach a piece of colored cardstock to the back of the letter cutout page, making sure to keep the letter part folded down so it doesn’t attach to the glue. 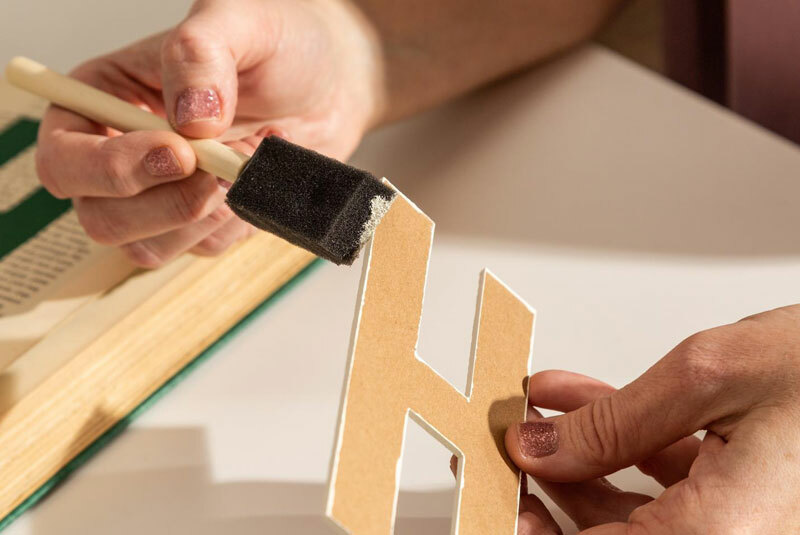 Now carefully glue the chipboard letters to the back of the hand-cut book letters. Finally, hot glue a thin line to the bottom of (back side) of each letter to make it stand up. Hold in place until glue is completely dry. You may need to repeat adding thin lines until the letter can stand up independently. Once you get the assembly process down, just repeat for all the remaining letters in the name/word you are using. To display, we simply layered the side edges of each book a little bit over each other in the correct order as shown in the picture above. We were so happy with how this project turned out! 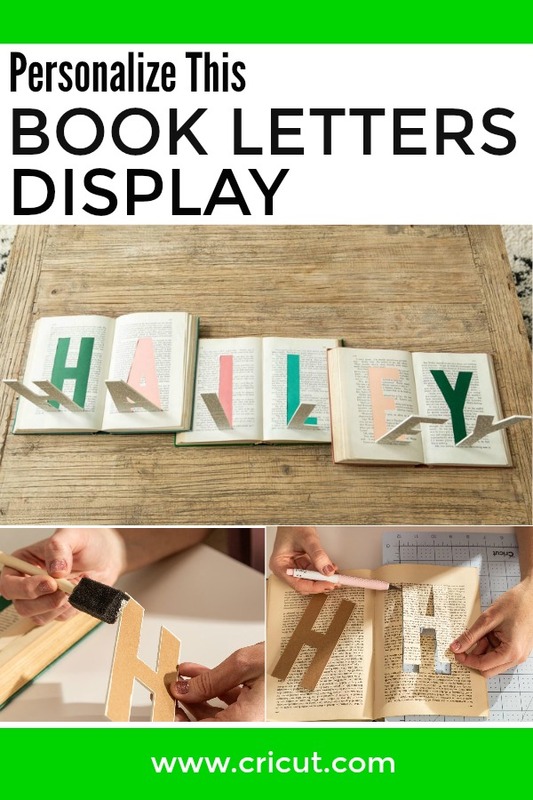 I know my book-loving daughter wants one for her own room, and it will be fun to let her choose her favorite colors and help make this unique piece to display on a shelf or bookcase.